Randy Adams is Professor of Trumpet at Sam Houston State University where he has taught since 1993. 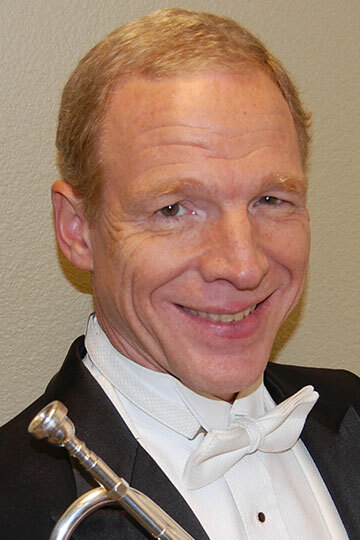 He served as Houston Symphony Orchestra Interim Trumpet for the 2001-2002 season and has been a member of the Houston Grand Opera Orchestra since 1984. Randy also performs with the Houston Ballet Orchestra and he performed Broadway musicals for 12 years with Houston’s Theatre Under the Stars. Randy toured Europe during the summer months for 20 years with Alpenfest singing, yodeling and performing cornet solos, alpenhorn, guitar, musical handsaw, European folk music, and a variety of other musical styles, and he is now performing in Texas and surrounding states with his own band Auf Geht’s Musik. Randy plays guitar and bass at St. Cuthbert Episcopal Church in Houston, and he has recorded two solo guitar CDs for the church. He has also written more than 140 hymn arrangements and descants for brass and winds along with guitar chords and composed sacred choral anthems for CuthbertPraise, and he has written extensively for the SHSU trumpet ensembles.